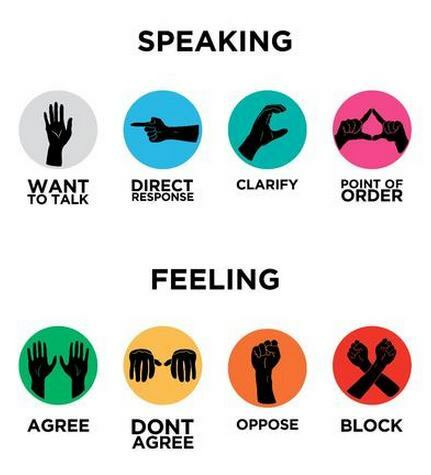 using hand signals for better meetings – Love. Life. Practice. Occupy Wall Street. The phenomenon raises a lot of eyebrows, shaking of heads, grimaces. Regardless of where you fall on the political spectrum, looking at it as noble or futile or both, it was, for a time, an undeniably potent force. One of the more powerful tools that it used was a conversational technique using hand signals. It’s not entirely original – this kind of thing has been used by everyone from Quakers to the Civil Rights movement. I have seen it creeping into conferences and such that I attended over the past year or so – people snapping their fingers or waving their hands to indicate approval, for example – but I experienced it full-on in a more recent “lean coffee” a couple of weeks ago in Seattle. Now, Lean Coffee is a whole other thing, using the Kanban Technique pioneered by Toyota, but this particular discussion also used a version of the hand signals in the process. Seems trite? And yet, amazingly effective. In the flow of conversation, if someone was talking, the others would often indicate their feelings about what was being said with the lower set of signals. That tended to give the speaker a good idea of how they were being received, and if they were being head (not just listened to). In the Occupy method, a response to whoever was speaking would be indicated by pointing a finger at the speaker, and saying something new by the “Want To Talk” signal ingrained in students for hundreds of years. In this particular Lean Coffee we used the pointing fingers for something different. If someone wanted to speak, whether response or something new, they would raise their hands. If others felt that they wanted to hear what the new person had to say, they would point a finger at that person raising their hand. As often happens in conversations, more than one person might have things to add – and people would use their other hand to point at the additional people with ideas. If it sounds complicated, it really wasn’t. The pointing fingers (sometimes with two fingers to indicate first/second choice) gave a pretty clear idea of who was next in the pecking order, and it kept people from talking over each other. The “feeling” hand signals let people respond to what was being said without interrupting the speaker. An additional element was timing. Each person had seven minutes to start with when they began speaking. At the end of that seven minutes, people would vote on whether to give the person another four minutes to speak. At the end of four minutes, people would vote on giving an additional three, then two, then one. Voting was a simple thumbs up/thumbs down or sideways for “neutral” (and if a majority were neutral, then the subject was deemed not interesting enough to continue). The intent was to keep people from droning on and on or repeating themselves (there’s also a hand signal for that, twirling your fingers around each other, but that wasn’t part of the Lean Coffee I attended). If all of this sounds silly or artificial, it’s because it is. Then again, did you watch the rules of the Texas State Legislature when Wendy Davis made her stand? Again, regardless of your politics it can’t be denied that there were arcane and arbitrary rules being used by both sides to try and achieve their ends. Ever since the first campfire discussion we’ve tried to come up with rules and methods to make group discussions more comprehensible. In a perfect world everyone is equanimous, concise, polite, and seeking mutual understanding. Anyone who’s been in any kind of committee meeting knows we do not live in a perfect world. I didn’t stay for the whole discussion, and at the time I found I really didn’t like using the signals. They felt constraining, they felt a little silly, they felt like they drained the passion out of the conversation. I looked at it as a simple experiment, but not something I’d want to adopt. Then I went to Ann Arbor last weekend. Have you ever been a part of a group of artists discussing something? How about a group of teachers? It can get pretty raucous and passionate. Now imagine a group of artists and teachers talking about how to teach art, in a room where there are a bunch of other artists and teachers actually teaching art. Mind. Blown. The ideas flowed and expanded and overlapped and synergistically built on each other and it was amazing. It was also chaotic. Interruptions. Hard-to-hear voices, especially when people strongly agreed or disagreed with something. Lots of hands raised, sometime unseen by the person speaking or by others who simply spoke up. Suddenly at a certain moment when I saw one friend across the room wanting to talk, I found myself pointing at her. Another woman to my left raised her hand as well, but I knew most people couldn’t see her, and I found myself pointing two fingers of my other hand at her. It was a natural reaction: we should listen to her next, and then this other person needs a turn. Sure enough, the person who was speaking saw my hands, looked over, and ceded the table to the new idea. In other words, it may have been silly and artificial – but it works. Here’s your challenge this week: give it a try. Maybe around the dinner table with kids, maybe at an informal “test” meeting at work (remember, you don’t have to reference Occupy Wall Street; use Toyota, it’s got a better track record). I suspect, like me, it will feel really weird during that first meeting, and you might just dismiss it as a harebrained idea. But I bet at your next meeting without it, you’ll wish that at least some of the people used it. Then again, I could be wrong. Let me know what you think!